Start with a clean , piece of drift wood. Hose it down and allow to dry. It helps to remove the piece from the garden. Colours: Red, Blue, Green, Yellow & Purple. I Mixed one part paint to 3-4 parts water in my bowl (Add more for brighter colour). I used my paintbrush to stir it around. I then painted the coloured water onto the wood, one colour at a time. I rinsed the bowl & brush between colours to keep the colours more vibrant and true. If the colour is not bright in some places, just add another coat. I placed the wood back into my garden, and voila! So colourful. Then the winter came and the snow covered my drift wood. Spring came. The snow melted. 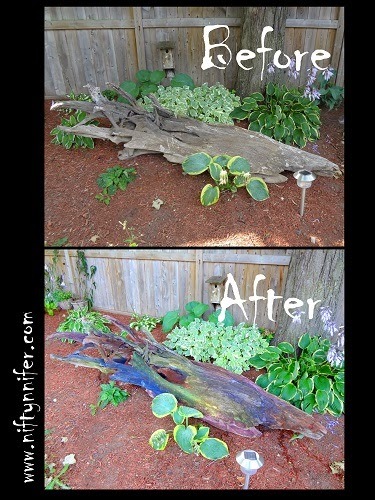 And my drift wood held it's colour. It looks even more beautiful this year.